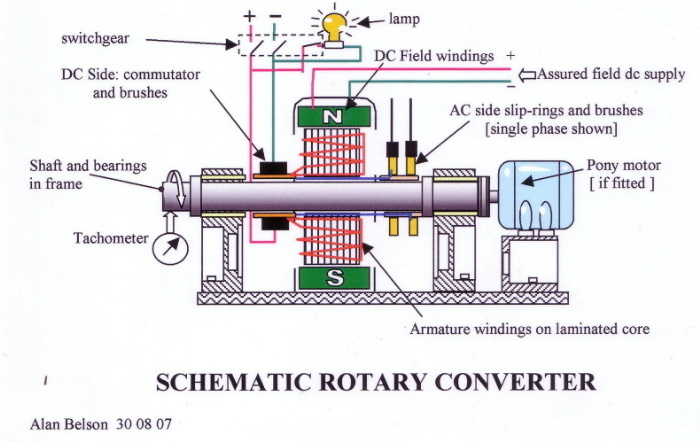 I mentioned the Rotary Converter several times in the Transverter thread. The concept of this machine may be a lttle difficult to grasp at first. Well, it was for me! Here's some further clarifying thinks on the subject. My sketch shows a schematic of a simple shunt-wound dc dynamo, 1 pole-pair, 2 circuit winding, where the field windings are permanently coupled across a dc supply while the machine is running. Such a machine will also run as a motor if connected across a suitable dc supply. Permanent magnets could replace the field windings in a small unit, of course, but the latter's coils draw a relatively low current. Easy and economic speed adjustments using a rheostat are thus possible by varying the field current. A dc dynamo is fundamentally an ac machine with a commutator and brushes to rectify the alternating current it produces, so it follows that if we were to imagine adding a set of slip rings and brushes to such a machine, [ say on the opposite end of the armature from the dc brushgear, for convenience as shown] and then tapped into the armature windings, we could generate an alternating current as well as a dc one. Imagine such a machine uncoupled from its engine. If we connected it to a dc supply as a dc shunt-wound motor, it would run up to a certain speed, commensurate with the field-winding volts and back-emf in the windings equalling the applied dc volts, less the losses in the armature, brush gear etc. But equally, an ac voltage would appear across our new slip rings, with a hz and number of phases determined by the rpm attained, the number of slip rings and the numbers of pole pairs and taps. Let’s also imagine that, by strokes of luck, midnight, lightening and genius on our part, the armature rpm, the phases, the voltage and the hz of our generated ac are of the exact same values and sine wave quality as those supplied to us by those nice folks at the POCO. We could then synchronise and connect up their ac output with ours. Safety Note. Please, don’t try this at home, remember we’re only imagining this! There are many dangerous issues to be aware of here, apart from the obvious risk of an electric shock . The motoring speed of a Rotary Converter is restrained by the field windings' "back-emf" in certain circumstances. Loss of the ac voltage when running with a weak field-current, whilst connected to an external dc supply, would result in the machine possibly spinning up to a centrifugal burst. Real Rotary Converters incorporated centrifugal switching and overspeed cut-out devices on both sides to prevent this. The dc side must attain correct polarity at start, and again in real machines steps were taken to make sure + really was + . I will not go into the detail of how we would sychronise our ac outputs, but it is easily achieved, and particularly with poly-phase machines, just as easy to get spectacularly and disasterously wrong! Finally, Rotary Converters seriously overheat if run at anything other than near-unity power factor. At 0.9 P.F., for example, winding conductor heating increases by 23%. You will see that our imaginary machine has one pole-pair as drawn. To achieve 60hz would require its armature to turn 3600 prm. If the pole-pairs increase in number, the number of phases increase and the rpm for a particular hz falls, so a 12-pole machine spins 600 rpm at 60hz and is normally wound 6-phase, requiring star/double star transformer connections to obtain a 6-phase supply from a POCO 3-phase. To connect our baby into a 120v single-phase supply would require us to operate at acv x 1.414 = about 170vdc. Should we require to operate at a different dc voltage from 170v, a transformer would be necessary on the ac side, tapped for small adjustments of say +/-2.5% steps, as the relative voltage ratio in the Rotary Converter is near enough fixed, less losses. Now that we are all paralleled and motoring sweetly, [ 3600rpm on the tacho. I just dreamt I added! ], let’s imagine switching off the dc supply to the commutator and switching in a resistive load, such as a suitable-voltage incandescent bulb on the dc side, as sketched above. Note that our field current remains intact as an assured supply [ from a battery perhaps ]. Our machine will now start generating on the dc side, lighting the bulb. This event should slow down our armature rpm of course, but we are paralleled into an ac system now and our machine tries to remain in sync with it. The angular lag caused by the armature slowing now causes current to flow from the ac system through our machine’s armature to try to maintain our speed. Hence our machine motors on the ac side and generates on the dc side. Since we are both motoring and generating in the same conductors, the arrangement is of direct conversion, that is 100% from ac to dc. The thought to cling on to, is that both dc and ac currents are flowing in the same conductors simultaneously. It is evident that the dc voltage at the commutator bars must exist in the armature windings as well as in the external dc circuit, and so too will the ac current incoming from our slip rings. We might now mentaly add, [ since it costs nothing! ] , a dash more sophistication with a synchronous ac pony-motor nailed to our shaft, to bring our rig smartly up to the correct rpm when starting. Then we could run it up from the ac side without worrying about excessive amps draw on our armature, nor need a dc supply on hand when starting, although a dc start would be possible. This is exactly the arrangements that the electric subways used to switch in extra units during rush-hours. You will have noted that our machine is reversible; it can in theory take a suitable dc supply and feed converted ac into the grid. We just thunk a Rotary Converter! The rotary converter you describe was in use in New Yorks Edison DC Distribution System from the early 1900s. It consisted of rotary converters from 1000 kW to 4500kW units. These units were fed from an 11 kV 25 Hz 3 phase system through a transformer that stepped it down to 600 volts (6 phase with a derived neutral). The output was 250 v dc with a neutral. The rotary converters without the derived neutral used a compensator (motor/gen) combination which could be used as (motor/motor)(motor/gen)or (gen/motor) when connected between the positive and negative buses to compensate for any umbalance between the positive and negative buses. These converters could be started from the ac side using a wye-delta switch, if the unit came up in the correct polarity its speed and field could be adjusted to match the dc bus and then connected to it. Units could also be started from the dc side using a starting resistor box, when the resistance was all cut out, the unit was brought up to speed and synchronized to the ac side. I believe these units were retired in the late 1970s or early 1980s and were replaced by submersible rectifiers to supply the remaining dc system in lower Manhattan. Richxtic; by chance I have more stuff coming down the drains via Paul [moderator]. The NY subway systems acted as a model for others to copy, which is what all the best Engineers do, if they have any sense! A lot of British practice, apart from the 50hz, came mainly straight across the pond. 1500kW rated for traction or lighting duty - 11,000V 3 Ø supply 50hz. [British] = 12 pole @ 500 rpm. 440/480vdc 3-wire lighting, or 550v dc for traction. Regulation for load transfer was by shunt field regulation, the two voltage ratio ranges obtained by tapping switches on the transformer [not shown on the circuit drawing]. These were interlocked with the main isolator to prevent use under load. In addition, other taps of ±2½% and ±5% were provided on the HT side for voltage adjustment. Transformer was an oil-filled 1650KW rated unit, naturally cooled construction, wired star/double star. She could safely run 50% overloaded for 15 minutes and take a 100% overload momentarily. Approximately Unity Power-Factor, by transformer design, was at 460-550vdc Mechanical brush-oscillators were fitted at slip rings and commutator, to even-out wear and prevent grooves and flats. SELF SYNCHRONOUS STARTING- refer to circuit drawing. The pony motor was direct coupled to the main shaft. A double throw switch, [see circuit], was provided for the motor. When this switch was closed in the top position, the motor could be used for running the rig at near normal speed for commutator / slip-ring grinding if required, [ with safety precautions taken, obviously ]. Starting was as follows: All switches at 'open'. The main 11,000v isolator and then the shunt field switch were closed. To excite the pony motor; the switch was put in it’s top position, and the machine started to run up. The dc side started to excite itself as an ordinary dynamo, and it built up the correct dc polarity due to pre-energising the field. Polarity was however checked on the center-zero voltmeter shown. A system for rectifying incorrect polarity existed which was only necessary in rare circumstances, such as human error, incorrect previous shutdown or a malfunction. By the time full rpm approached, the dc side was at about half normal volts, and at this stage the starting motor switch was thrown to the second position. 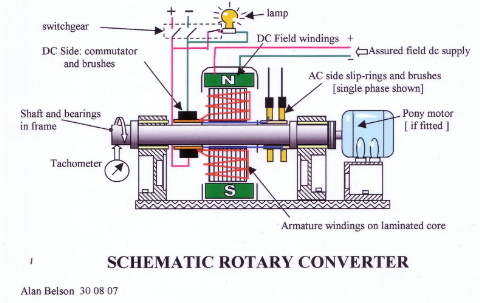 The Converter retained its correct polarity and the ac now injected into the armature windings came into relation with the fixed magnetic system poles. A synchronising torque thus resulted and the armature fell into sync, with a few fluctuations before stability was achieved. As soon as this steady condition pertained, the dc volts rose to their maximum, and by adjusting the field rheostat a definite position was found for the near enough correct dc output voltage. In practice, the operator watched the pony motor voltage, as when this value was at a minimum, the dc volts were about right. The main low tension ac switch was then closed and the machine steadied into full operation within a few revolutions. The motor start switch was now opened, the pony motor freewheeled and the machine was ready to parallel its output into the dc side by final voltage adjustments on the rheostat. The dc volts needed to be equal each side before switching into service. As far as I can ascertain, the above or similar starting methods, using an ac pony-motor, was introduced in England about 1910, probably earlier in the US. Older machines can be seen in museums without ac starting-motors. By the twenties ac starting was the most common method. For a dc start, the machine was run up as a shunt-wound motor on full-field dc volts. It took longer to start, as the dc motor had to be run up incrementally, with a face-plate or other variable resistance/shunt type starter and the synchronisation required much skill on the part of the operator in smartly closing the switches. Even when perfectly executed, the machine usually fell into step with a graunch due to currents flowing into the armature. To get the timing right one had to "take the phases". The early method was to use lamps wired across phases, not easy to interpret at a comparatively fast frequency and with but a faint indication of sync, little indication of voltage and no idea if motoring was fast or slow on the armature RPM. The use of a 'Synchronoscope' was a far superior method for dc starts. This essentially comprised a tiny stator and rotor, one being connected across the bus bars, the other across the incoming machine, via transformers if necessary. By phase-splitting with an inductor or capacitor, one set of windings produced a rotating field. The other set was arranged so when its field coincided in frequency with the other set, no torque was produced and the rotor was stationary. A pointer needle was arranged in a dial-instrument to show the phase relationship, and when both sides were in sync, [ usually with the needle pointing up ], the switch was promptly closed. By the position of the needle left or right of center, one gauged if running was fast or slow and could set the field rheostat accordingly . Usually the Synchonoscope was mounted alongside voltmeters to give the operator all the information required for the least traumatic switch-in. By the 1930s, the use of totally automatic synchronised starts took all the fun out of the job! These are similar to the ones that I operated for several years as a DC substation operator in NYC. The main differences were that we did not use pony motors, although the NYC transit system did. In addition, when we synchronized the rotary converters we used a ac voltmeter and a set of lights, when the vm read near zero decreasing or the lights were dimming to out we closed a spring loaded oil emersed motor driven circuit breaker. The exact operation as so eloquently stated by Alan is better then I can remember, as I left the DC system in 1969-1970, and do not have any of my reference material left. Rich, welcome to ECN BTW. Wow!! You actually operated these m/cs! I have to rely on reference books, manuals and stuff and the www, as I spent all my "working" life in design offices or in factories on production lines. Post anything else relevant if it comes to mind. I'm off to a good restaurant now. I can afford it as I can collect my OAP at last from HM Gummint from today! Hooray! The station that I worked in was operating from about 1890s and used dymanos at the time. I found log book dating back to 1902, it made for some interesting reading. Well, enough about the past, I have to go back to earning a living. Certainly in the late 19th/early 20th century there was a lot of this. For example, those interested in telephone history here will know that the Automatic Telephone Manufacturing Co. was created to manufacture Strowger equipment under the patents which were held by Automatic Electric of Chicago. But back on the subways, remember that while original cut-&-cover stretch of the Metropolitan Underground line was very British and designed for steam, by the time the "tube" lines (Piccadilly, Bakerloo, etc.) were built electric traction was to be the norm and not only were some of the systems influenced by U.S. practice of the time, even the funding was arranged by American financier Charles Yerkes. I think there was probably more American influence in those early days than a little later, when we tended to drift away and "do our own thing" more. Wikipedia tells us that Yerkes died in New York in 1905 well before completion of the London work, though the tubes were well under way. One accomplishment of Yerkes that perhaps further benefited Britain was his success in preventing J. P. Morgan from involving himself in the London transit development.